14ymedio, Zunilda Mata, Havana, February 7, 2019 — Together with her kitchenware, Dagmary has several plastic containers that once held soft drinks. 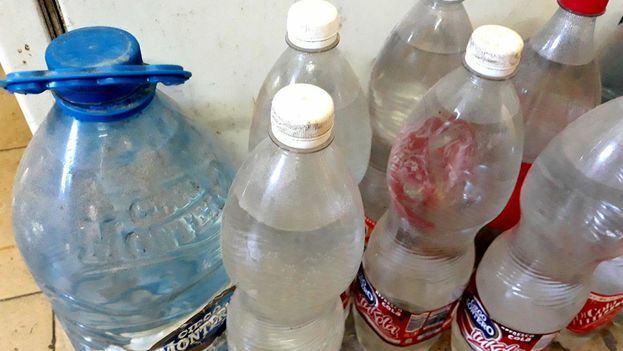 “We use these bottles to hold water or save milk,” this Matanzas native living in Havana explains to 14ymedio. The so-called “cucumbers” make up part of the domestic scenery but have also invaded public roads, the coasts, and the countryside. Clogged drains, fish eating the plastic, and dirty rivers are some of the country’s problems caused by bottles made of polyethylene terephthalate (PET). Although forceful campaigns have arisen in other countries to reduce their presence, in Cuba the strategy to reduce them has not quite taken off. “Every morning when I arrive to set up my rod, it’s a mess of plastic bottles,” laments César, a 48-year-old fisherman who arrives very early in the morning at the entrance of Havana Bay. “A few years ago having a plastic bottle was almost a luxury and families kept them to do a ton of things, but now they throw them out everywhere,” he points out. “I’ve found little fish trapped inside these bottles and once I caught one that had eaten a piece of a cap,” remembers César. A 2016 report published by the United Nations Food and Agriculture Organization (FAO) confirms that the presence of microplastics has been found in 800 species of mollusks, crustaceans, and fish. A study carried out in Cienfuegos by the biologist Arianna García Chamero confirmed the presence of these microplastics in Jagua Bay. “It hit me that the levels there are sometimes similar to, even greater than, the ranges found by studies in ecosystems of very industrialized places on the planet,” explained the scientist to the local press. Currently, Cuba Law No. 1,288 obligates all state-owned bodies to deliver waste, especially plastics, to the Raw Materials Recovery Companies, but the majority of these waste products end up in garbage dumps. The same occurs in the residential sector, due to the lack of a mechanism to separate trash and the absence of recycling education. Individual pickers dig through trash containers on public streets in search of these products in order to bring them to the more than 310 state-owned raw material collection centers in the country. In tourist areas they can also be seen gathering water bottles left by visitors and soft drink and beer cans. “Everything that we don’t see in time to take out of the dumpster ends up in the garbage dumps,” explains José Carlos, a retiree who after working four decades at the gas company spends his days trash-diving in search of something that could be useful. “I prefer to look for cans and pieces of metal because Raw Materials pays us by the weight of the merchandise and plastic weighs much less,” he says. “Sometimes I pick up plastic bottles that have no damage, that aren’t smashed or dirty, to sell them to yogurt producers who pay well for them,” he comments. “But if they’re not like that I don’t pick up bottles, although when there’s some outdoor concert and they sell little bottles of soft drinks…” he says with a smile. On the island there is no restriction on the sale of plastic containers in public places, not even near nature parks like they have implemented in several European and Latin American countries. For the majority of Cubans, a plastic bottle is still a symbol of status or of economic solvency instead of an environmental problem. “We’re passing from being a country where the only thing people had to save something in was glass bottles — sometimes they lasted years in a kitchen — to one where parents want to send their child to school with a new plastic water bottle each week,” believes César, the fisherman. “Then, all that ends up here,” he points out the trash in the water of Havana bay. In 2017 an experimental trap was installed in the Almendares river, to the west of the Cuban capital, to trap the animals, logs, plastic bottles, and remains of containers that were floating in the water. The obstacle blocks them from reaching the mouth but the trash collection has to be done manually, so it’s not a system that can be applied on a large scale. Two years ago a study was carried out to apply in Cuba some of the recycling technologies that have been tested successfully in other countries, according to what Estela Domínguez, vice director general of businesses of the Union of Raw Materials Recovery Companies (UERMP), told the official press. The project should start in Havana and with the sorting of waste in people’s own homes, but the complex economic situation of the island has slowed its implementation.